Use this ‘Tax-Deductible Donation Tracker’ to track your charitable contributions throughout the year. 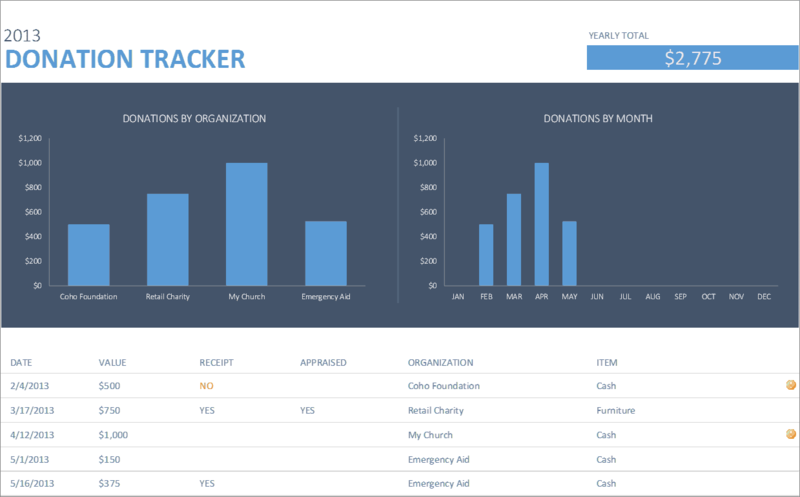 Track your charitable contributions throughout the year with this Tax-Deductible Donation Excel Tracker template. Charts show donations by organisation and totals donated each month. Use this data at the end of the year to report your tax deductions. …with this Tax-Deductible Donation Excel Tracker template you will be adding an essential tool to help you keep track of your expenses, manage your cash flow and keep your business cash positive. …with this sleek well designed Tax-Deductible Donation Excel Tracker template, there is no need to worry about layout or formulas, as we have taken care of all of this for you. …to track your charitable contributions throughout the year. Ready for you to start using right away!